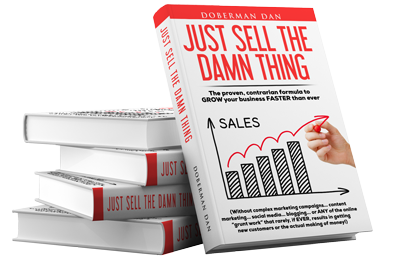 Back in April I tested a new system of marketing and selling coaching/consulting. It worked better than anything I’ve ever done. In fact, it brought in just over $205,000 on the front end from just two emails sent to a list of only 130 people. Since then I’ve been tweaking it and it’s working extremely well. So well in fact, I’ll never go back to the old way of doing things. That explains why I don’t come out with any new products and courses anymore. I no longer have to follow that old outdated model. This new model has replaced everything. And I just spilled the beans on EXACTLY how I’m doing it. I revealed the entire A-to-Z plan to the knights in my Marketing Camelot. It’s all in the January 2016 issue of The Doberman Dan Letter. It’s being mailed out to all my knights as we speak. And it’s not too late for you to get a copy, too. Simply click here and join me in the Marketing Camelot. …along with some other unannounced cool things that will help you make a lot of money in 2016. What you’re about to discover is one of the easiest and most fun ways of making money I’ve ever discovered. I think you’re going to be really excited about it. Click here so you don’t miss out on the part-time 6-figure secrets I revealed in the January issue.